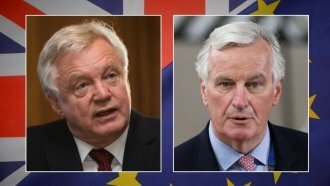 This Bill Tries To Take Chaos Out Of Brexit; So Why The Controversy? The U.K. is figuring out what to do when it loses a ton of European Union laws. A major Brexit bill just passed its first big test — but not without criticism. A majority of those in the House of Commons backed the EU Withdrawal Bill on Tuesday. In it's simplest terms, the bill would end the practice of European Union law trumping British law. It's a necessary step for the U.K. to leave the EU, but the process is anything but simple. Some of the difficulty stems from ditching EU laws; it's estimated there are about 80,000. To avoid the chaos of having years of EU laws just disappear, the Withdrawal Bill would convert them into British law when Brexit happens. But who's responsible for those conversions is causing controversy. The bill hands that job to ministers who are appointed by the prime minister. And they wouldn't need to discuss it with other members of Parliament. Those who oppose the bill, like Labour Party leader Jeremy Corbyn, argue it's a "power grab" by the prime minister's party. Though the Withdrawal Bill passed its second reading Tuesday, it's nowhere near law, yet. It's now moving to the committee stage, where each part of the bill and the more than 150 proposed changes, will be debated.